Short weekend in Castlemaine | 15,000kms of Food! The star of this trip was the little restaurant Star Anise, which we stopped by in Kyneton on the way to Castlemaine. We decided to stop for lunch and armed with my trusty Good Food Guide 2010 made the decision to go to Star Anise. The other options available were Annie Smithers’ Bistrot and Royal George Hotel. Annie Smither’s was not open and the Royal George Hotel was too unreasonable for a simple Saturday lunch. Note about Kyneton, there are two main streets – one for the locals, and one for the tourists. Head to the tourist street – antique shops, second hand shops, cute boutiques, organic food shops and cafes/restaurants. 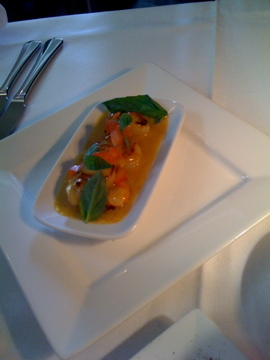 Star Anise delighted me – charming, with a husband and wife team who was front of house and chef respectively. 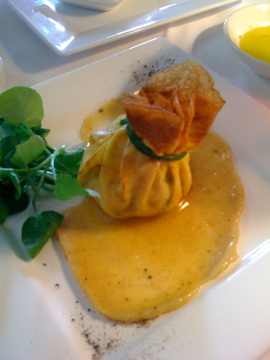 We started with a delicious crab “money bag”, followed by scallops in burnt butter and main was a roast duck (with star anise of course!) served with beetroot. 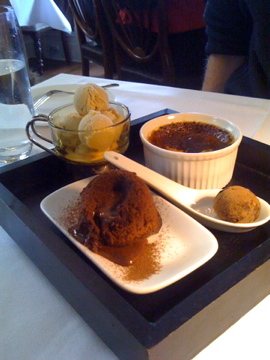 The chocolate dessert was one of the best desserts I’ve ever had – it consisted of warm chocolate pudding, creme brulee, caramel ice cream and chocolate truffle. We got into Castlemaine late afternoon and most of the shops were closed. We decided to head to the pub for a drink! Found a great place called Public Inn right on the main street and stayed for dinner! Nice atmosphere and good food. Again, we stopped at Trentham on the way home. Lunched the Cosmopolitan Hotel again. Word of advice, do not dine outdoors in winter! It’s cold! Brr! Also stopped at Dalesford and Hepburn Springs… Lovely, however, we did not stop for long. Doubt I’ll be heading back to Castlemaine but I’ll definitely be back to Kyneton for Star Anise! 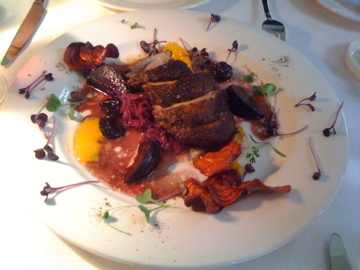 You must come and give Castlemaine another try, there’s great eating up here!